Tamblyn made an appearance in Chicago in 2010 at the Hollywood Palms in Naperville, Illinois, and did an interview with HollywoodChicago.com regarding the 50th Anniversary of the film “West Side Story.” After talking about that experience, he began to reminisce about his other career exploits. In a talk that lasted close to an hour, he spoke about the transition from child to adult star, encounters with Elvis Presley and adventures with rocker Neil Young, director David Lynch and actor Glenn Ford. Russ Tamblyn was born in Los Angeles, and made his first appearance in a film – ”The Boy with the Green Hair” (1948) – when he was 14 years old, appearing with his lifelong collaborator, actor Dean Stockwell. He signed a contract with MGM a couple years later, and had a featured part in “Father of the Bride” (1950) as Spencer Tracy’s younger son. He began a new chapter as a dancer with his role in “Seven Brides for Seven Brothers” (1954), when he combined his background as gymnast with Michael Kidd’s unique choreography. This was immortalized six years later with his signature part as Riff in “West Side Story” (1961). He continued to work as an actor in the 1960s, but took time off to pursue a career as an artist. He re-emerged in the early 1990s as Dr. Lawrence Jacoby on the cult TV classic, “Twin Peaks.” His daughter is actress Amber Tamblyn. Instead of a Q&A format, Tamblyn spoke on a random set of topics. 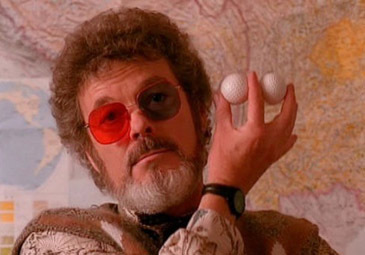 The following are some classic Hollywood stories, as only Russ Tamblyn could tell them. Russ Tamblyn: The wonderful thing about the studio system was that the movie company had a collection of directors, producers, music composers and writers who were all under contract. They were switched around, they would work on one film and then another one. It was very family oriented. I remember that every Saturday night at the MGM Studio theater they would have an old movie night. I saw all the great old films in their libraries. They also had a dance classes and a school, which I attended with Elizabeth Taylor and Dean Stockwell. Tamblyn: I wasn’t a dancer that incorporated tumbling, I was actually an acrobat that became a dancer. I had studied tap dancing when I was ten years old, but then I became a child actor. For years, that’s what I did, and signed onto MGM as just an actor. When ‘Seven Brides for Seven Brothers’ came along, the choreographer was Michael Kidd, and he wanted all the brothers who were cast to be great dancers. MGM pushed back on him, telling him he could have four great dancers, but two of the brothers would be actors already under contract. I was one of the actors chosen. I was only suppose to have lines in the movie and that was going to be it. I went onto the set with the other actor brother, Jeff Richards, who was a big fellow who not only didn’t dance, but hated dancers. [laughs] If you watch him in the film, he doesn’t dance, he could barely walk. While we were checking out the set, Michael Kidd came up to me and said that he heard I was a gymnast. I demonstrated by doing a backflip. Kidd said great, we’ll put it in number. I told him I wasn’t going to dance with the professionals. He told me it would just be like square dancing. There was one number that Jane Powell sang, ‘Goin’ Courtin’,’ that included the lyric ‘going dancing.’ Of all the brothers in that number, I was the only one that naturally looked like he was learning to dance. [laughs] You couldn’t get the professionals to do that, so Michael put me in front for that song. As a acrobatic dancer, it was great for me as an actor. I could do a western and leap on a horse, and look like I’ve been a cowboy all my life. I could do comedy and executive pratfalls. With fight scenes, I could fall correctly and never get hurt. If I was advising a young actor, I’d tell them to learn some gymnastics. Tamblyn: I worked with Elvis a bit on ‘Jailhouse Rock,’ and got to know him as well as anybody in Los Angeles at the time. I had a beach house that I sublet to him while I was doing ‘Peyton Place.’ He needed the place as a getaway, and basically wrote me a check for that month’s rent. I wish I had kept the check, that would be worth more than the money I got. [laughs] When I came back, the place was totally wiped out, because he had a party there every weekend. There was food all over the place, all the dishes and glasses were trashed. When I came home, it was a garbage pit, plus there was an eviction notice on the door. This was my welcome home from Elvis. Tamblyn: He was my next door neighbor in Topanga in the 1960s. It was a dead end street on a steep hill, and Neil had married the girl that lived next door to me. I loved his music, but I wasn’t really paying attention to what he was doing. He would just sit in my art studio while I was working, and not say much. We became friends, and he helped me with an art show. Dean Stockwell also lived in Topanga, and it was he who wrote the screenplay to ‘After the Gold Rush.’ Neil wrote the music, the film was just loaded with rock and roll people, and I was going to play an over-the-hill rocker who lived in a castle on a hill. The movie never got made, but Neil released the album of songs and it became the legendary huge hit. After he moved out of the neighborhood, he called me many years later and told me that he’d got some money to do a film with his songs in it [’Human Highway,’ 1982], and I would be his best friend in it and Dean Stockwell was his manager. We also got the group ‘Devo’ and Dennis Hopper to do the film. The movie is just awful, but I thought it was funny. I also ended up choreographing and directing his show ‘Greendale,’ and was on the road with him for a year and a half. I loved ‘Twin Peaks’ because it was such a great gig. First, I hadn’t worked in a long time, so it was great to have a job again, and second, it was such a far-out series. If there was any problem, it was that David Lynch got bored with it and moved on, leaving the show to the writers. It got pretty strange.